When programs are writing log files, you can watch them with any editor you like, cat, vi or emacs. This is sometimes necessary when programs are running in the background, or through some job management system, or as daemons etc.. But what about the updates? instead of cat. Now tail just sits there and waits for data to come in, and prints it. Easy. When you're done you're just pressing ctrl+c, and tail aborts (of course not your program). This might be a bit too much for very long files, so there's also the option -n, e.g. Which prints the last 100 lines and waits for new data. OpenCL/CUDA: How to resolve "Arguments mismatch for instruction 'mov' "
So the "mov" instruction only has problems when you are using constants in it. So if you're having the same problems, try to comment out all your assignments so you can find out which assignment is making problems, then split the assignment up. Note that you have to split it up several times otherwise the OpenCL compiler will "optimize" it back again for you. Julia is a new high-level, high-performance dynamic programming language for technical computing. High-performance assures fast execution, whereas dynamic languages enable fast development. Both used to be contradictionary features of programming languages, since dynamic basically means no compilation before execution, and that means: More work at run-time. However, since Just-In-Time-Compilers got better and better, now there is a way to have dynamic and high perfomance languages. Julia is one of those languages. They use the LLVM as JIT-compiler - which I think is a pretty neat idea. Installation is moderately easy as is described here . There are some precompiled packages here, but since Julia is pretty new language, it is best to do a git clone . For that, you might want to update your GCC, since I was not able to compile it with 4.1.2 which comes standard with OSX. 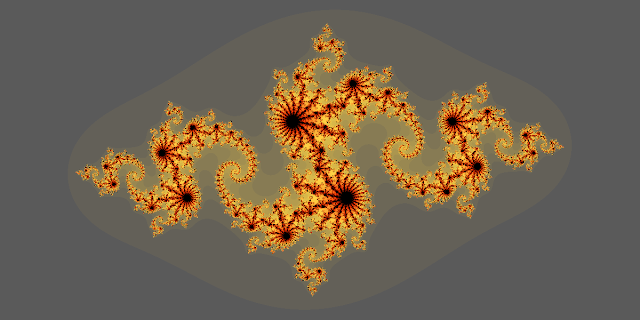 Since Julia has built-in support for complex numbers, we can now calculate, for example julia(0.5+0.2im, 256) . (taken from extras/image.jl). However, above approach yields more insight on the parallel algorithm. Where you replace 4 with your number of processors. The table shows the difficulties in parallel computing: Even if the algorithm scales perfectly in theory, the execution on N processors is not always N times faster. This is because of not all parts of your implementation and your hardware might scale perfectly, especially not for all problem sizes (very large or very small). The drastically difference of access rates for the L1/L2/RAM memory can even lead to results like the parallel calculation of the 2000x4000 image, which is 15 times faster on 8 processors than on one. Julia is a nice language with a MATLAB-style syntax which could have a big influence on scientific computing. Many applications are operating on the memory bandwith limit, or the communication bandwith limit, so with a JIT compiler, those would be just fine. Syntax Highlighting should now work. Fixed parallel calculation. load() is not @everywhere by default. Now working with Julia commit 2013-07-26, which changed DArray syntax and require. According to wikipedia, name mangling is a "way of encoding additional information in the name of a function, structure, class or another datatype in order to pass more semantic information from the compilers to linkers". The wikipedia article and this describe name mangling quite well. Now mydemangle demangles all names it can demangle and leaves the rest as it is. Be aware that this will not be available for all processors/compilers. // some compilers add an additional _ in front. skip it. Of course, there is some easy way in bash to do it. This requires demangle (part of KDE Dev Kit) and is not as fast and convenient as above method. The standard bash prompt on most systems is very unusable. Most of the time, it's just something like bash-3.2#, which doesn't give you much information. Knowing the machine you're working on and your current working directory is crucial, and if your prompt provides you this information this can make your life a lot easier. In my opinion, that's all information you need most of the time (except for maybe some git/svn information). I added the shortened hostname in front because i'm working on different systems a lot and this just helps distinguish them from the window title. You can add more to it, flashing colors and stuff, but it just gets unusable at some point especially when you have long directory names. [[ $EUID -eq 0 ]] && HOSTCOLOR="\[\033[1;31m\]SU $HOSTCOLOR"
You can just copy it in your ~/.bashrc or save it as ~/prompt.sh and add a source prompt.sh in your ~/.bashrc . Note: Of course this is not the ultimate bash prompt, every advanced user will have an own customized prompt. But I hope it's a good place to start :-).